BMW unveils autonomous, electric Vision iNext concept | Car News, Reviews, & Pricing for New & Used Cars. BMW is planning to launch 25 new electrified vehicles — at least a dozen fully electric — by 2025. 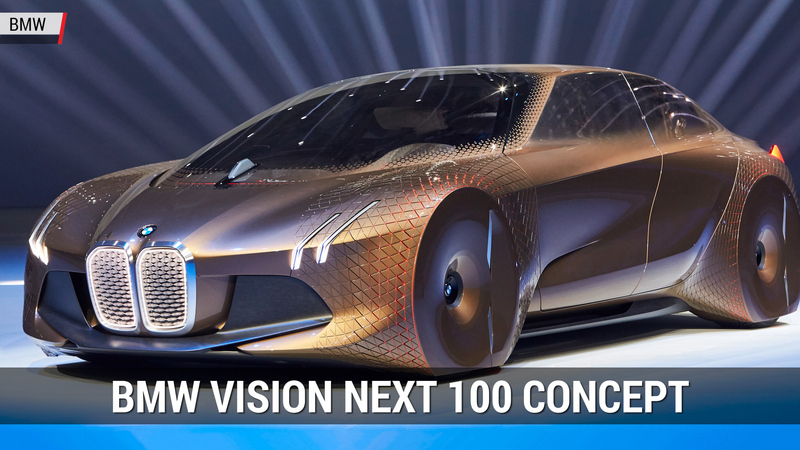 One of them, slated for 2021, will be based on the Vision iNext concept BMW has been teasing in recent weeks. As the car flew around the world on a Lufthansa cargo jet, we had the chance to climb aboard to see it in person at JFK Airport in New York. Now, we can pass along the images, and tell you what we learned about the iNext and BMW’s electric future on board that Boeing 777F. First thing’s first, let’s talk about that design. The look of that nose, with its interpretation of the BMW’s signature double-kidney grille, looked almost grotesque with its edges illuminated in the earlier teasers. In person, that fascia is far more approachable, especially when you’re able to view it in the context of the rest of the Vision iNext, which is a long, squat, spacious crossover with crisp lines, gigantic shoes, acres of glass and eye-catching aerodynamic bits. Its Liquid Greyrose Copper exterior has a matte appearance, and reflects colors in a way that you can’t really pin down the color on it — especially as the lighting changes. That grille is glossy plastic, behind which resides a number of sensors that allow for autonomous driving. The sizable side windows echo the kidney shape as they sweep rearward. The windshield swoops back into a large glass roof. There aren’t any mirrors sticking out — the iNext uses cameras — nor are there any visible handles. As you reach toward the car, a section of the surface illuminates to show you where to touch in order to open the gaping opposing doors. All around the car are interesting, subtle details integrated into the larger structure. The giant diffuser has illuminated highlights, and the profile of the slim quadruple headlights reveal layered stripes of gray, black and blue — a touch that reminded us of the three-color bands of BMW’s M logo. The inside of the car is a wide-open lounge. Two individual front seats are separated by a center console of wood and Jacquard fabric that looks like it could be an end table in a mid-century modern living room. The rear seating resembles a loveseat. The front seats don’t turn to face rearward like some autonomous vehicle concepts, but the headrests fold down to facilitate relaxed conversation. The steering wheel and pedals pop out or tuck away with a touch of the BMW logo on the tiller. A tablet-like screen serves as the instrument panel, while a second, wider screen serves as the infotainment interface. The Vision iNext includes some interesting technology. You wouldn’t know by looking at it, but integrated into the Jacquard weave of the rear seating has integrated touch control surfaces and LED lighting. You can trace certain gestures to control certain functions. Draw a musical note — and light trails behind your finger to complete the picture — in order to turn the music on. Swipe in either direction to skip through your playlist, and use pinch gestures to control volume. Interestingly, the wood on the center console offers the same functionality, lighting included. The second major “Shy Tech” feature — which is the language BMW uses to describe technology that hides out of sight until you use it — is the Intelligent Beam. A projector over the rear seat can turn any surface, like a black piece of paper, into an interactive screen. You could project images or video onto it, and control it with gestures or touch. The image follows whatever object you’re holding, so you don’t have to hold perfectly still for it to work. Of course, there’s a voice assistant on board. Vision iNext’s Intelligent Personal Assistant responds when you say, “Hey BMW,” and can perform a number of functions in-car or remotely, such as to control features of your smart home. A car based on the Vision iNext should arrive in 2021, after the battery-electric Mini in 2019 and the BMW iX3 crossover in 2020. BMW will use a modular electric powertrain architecture across its line of electric vehicles. This means batteries of different shapes and sizes, and one, two or three electric motors powering front-, rear- or all-wheel-drive configurations. We can’t imagine all of the technology showcased in the Vision iNext concept making its way to production — and neither can BMW. Regulators need to work out the autonomous driving landscape before that can go full force. The Intelligent Beam would need some serious refinement (not to mention a market demand case) before it would be ready for primetime. We’re not sure how much it would cost to make large swaths of your car’s interior function as touch controls. What the iNext does, then, is give us a glimpse into how BMW envisions its upcoming EV, and how people will use the space inside of its cars as automated driving technology advances. Sure, the future looks a little weird, but it surely won’t look quite as weird as this futuristic concept. We’re just happy to see that as BMW focuses on making more advanced cars, it’s still just as focused on the people who will be using them.